Each persons free items will be different but the 15 coupons seem to be worth around $50. 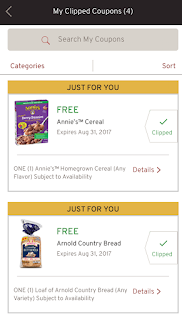 Clip the coupons in the app and after all the items are scanned have your cashier scan your barcode from the app and the 15 items will come off the total. There is also a $5.50/$5.50 coupon available to clip. My store was out of Arnold Country Bread, Annie's Cereal and I couldn't find the Chobani Yogurt 2 pack, but those would have been free too. I should be able to get them before the coupons expire on 8/31. 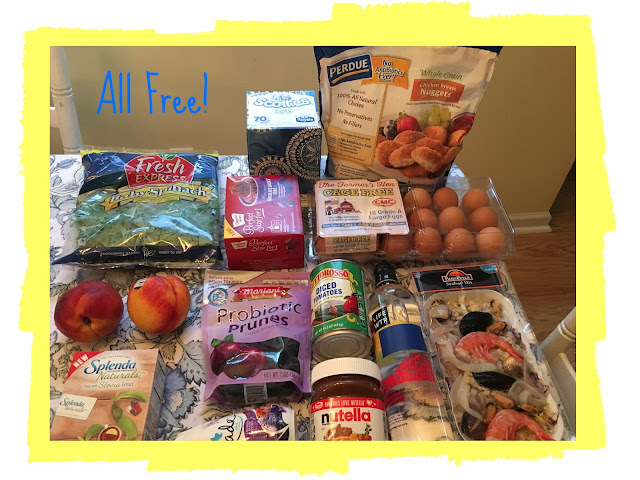 I used the $5.50/$5.50 coupon towards to the spinach and nectarines. 1. Download the Hannaford app on your phone. If you already have a Hannaford account you just update your info or create an account if you don't have one. 2. Clip the freebie coupons. There should be 15. There's also a $5.50/$5.50 coupon. 5. Prices of items will be deducted = FREE. 6. 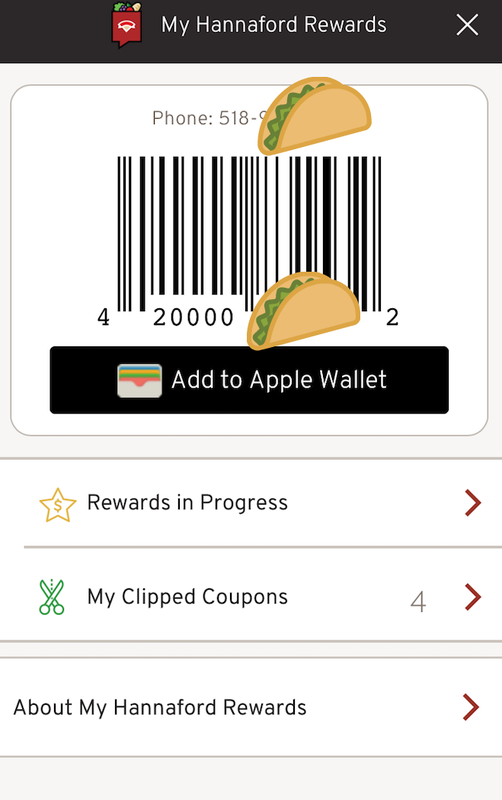 Scan your barcode each time you shop at Hannaford to accumulate the 2% savings. Update: If you don't see the freebie coupons maybe try waiting (one reader had them show up a few hours after she downlaoded the app) or delete the app and re download it. The app is new so it may have a few glitches, it seems to be working for most people though. For some reason no bar code shows up on my phone. Thank you though, it was worth a try. Does the barcode stay the same like cartwheel? If so, you could screenshot the barcode in case you have bad reception in the store. I don't see any free coupon items? I didn't get/can't see any free coupons either. I'm thinking my older phone (iPhone 4s) isn't supported by the app??? I have iOS 9.3.5 but no free coupons 😕. Not sure why I didn't get any free coupons. Any ideas why??? On the Hannaford site, it says you are able to put your cell number in the pin pad if you don't wish to scan the bar code. Has anyone tried this? Does it work? “Clipped” my $5 coupon and added it to my rewards but it didn’t deduct from my total at the register when my barcode was scanned.